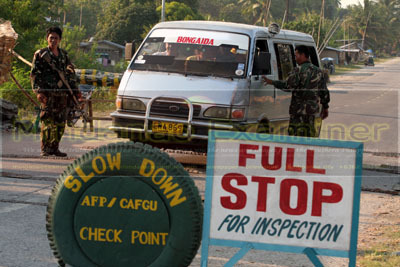 KIDAPAWAN CITY, Philippines (Mindanao Examiner / Aug. 15, 2011) – One person was reported killed when a road bomb exploded near the convoy of Maguindanao Governor Esmael Mangudadatu in the southern Philippine city of Tacurong. Police said the blast occurred at around 3:15 p.m. near the Land Bank of the Philippines in downtown Tacurong. A local radio station Bombo Radyo said one person was killed in the explosion. “It was the convoy of the provincial governor alright, but we still have no details whether there were any casualties or none. Our police chief and investigators are still in the area,” a desk policeman in Tacurong City said in a phone interview. He said the local police chief Gilbert Tuzon was in the area and could not give any interview. The mayor of Tacurong City, Lina Montilla, was also not available to make any statement. “She cannot give any statement at this time,” her assistant Michelle Motilap said in a separate interview. The radio station said local government spokesman Allan Freno has confirmed that one person was killed in the blast. The Army’s 6th Infantry Division, which has forces deployed in Tacurong City, confirmed the bombing, but did not give details of the attack. “We are still awaiting reports. There was a bombing and that’s all we can give,” said Colonel Noel dela Cruz, an army spokesman. No individual or group claimed responsibility for the attack and the motive was unclear or whether Mangudadatu was the target of the bombing. Mangudadatu’s wife and sister were among 58 people killed, including over two dozen journalists, in November 23, 2009 in Maguindanao province by allegedly by the clan’s political opponents. Police and military linked the brutal murders to the Ampatuan clan, whose patriarch and sons were arrested and jailed in connection with the killings. The clan denied masterminding the attack on the political convoy of Mangudadatu’s wife.